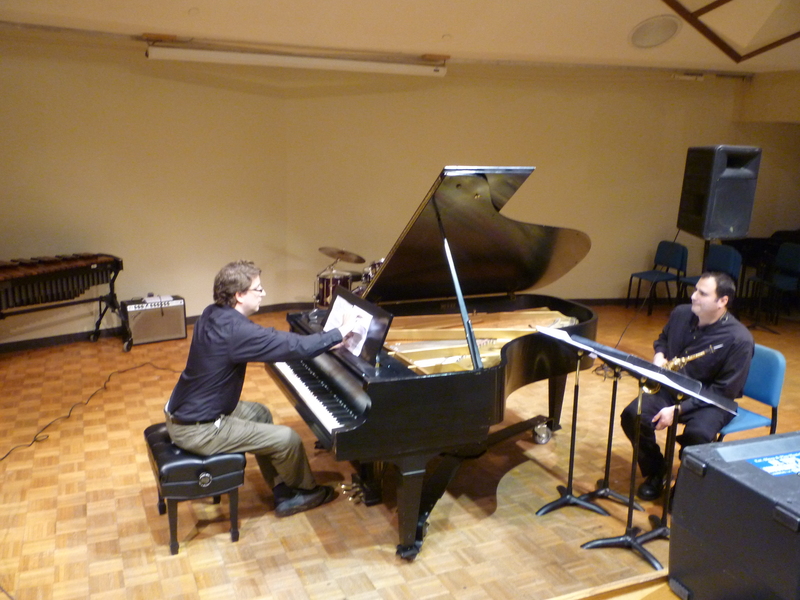 A couple of weeks ago, my piece Embers was performed on a concert of new works at Southeastern Louisiana University by Philip Schuessler, piano and Richard Schwartz, alto saxophone. The concert was a huge success. It was great to see so many students and faculty members participate in this concert, both as composers and as performers. There was quite a variety of pieces and styles represented and all were well-performed. The only hitch was of course due to technology (thankfully my piece was completely acoustic this time). One of the channels of our borrowed power amp turned out to be busted. However, the electronic works were still able to be performed, the composers just had to use the regular P.A. system of the recital hall (not great, it’s mostly for lecturing). I was able to get a decent recording this time. I’m still hoping we can do a studio recording once we are all finished with our finals and grading! Here’s the recording from the concert I recorded on my Sony PCM-D50. I also made a video, but I still need to edit that and this computer with its bum lower memory slot is of no help whatsoever. Categories: Acoustic Music, Saxophone | Permalink.